pink hawthorn, and sweet-smelling honeysuckle. 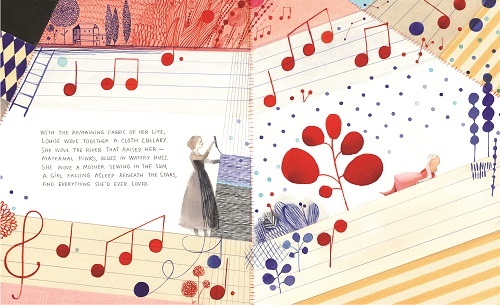 I’ve got some spreads today from Amy Novesky’s superb March picture book, Cloth Lullaby: The Woven Life of Louise Bourgeois (Abrams), illustrated by Isabelle Arsenault. This is an exquisite biography of Bourgeois, the French-American artist known for her sculpture and installation art. “Among tapestries neatly stacked like books in a library, Louise’s mother taught her daughter about form and color and the various styles of textiles. 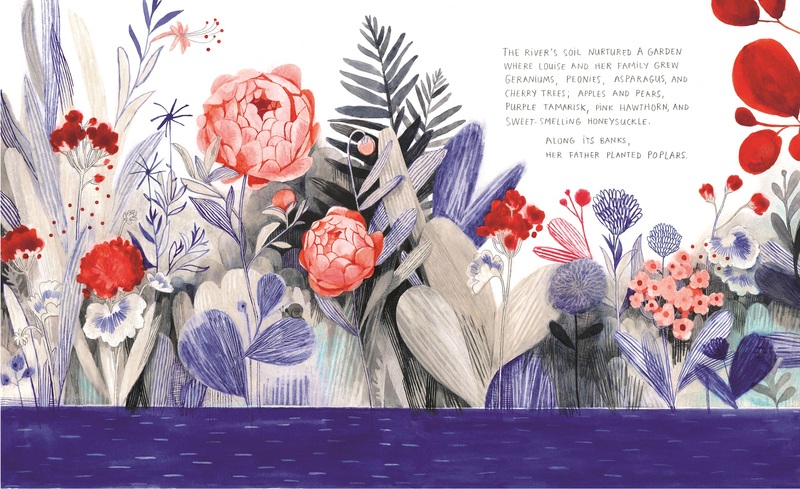 This eloquent book brings to my mind Patricia MacLachlan’s The Iridescence of Birds, illustrated by Hadley Hooper, one of my favorite picture books in recent memory. 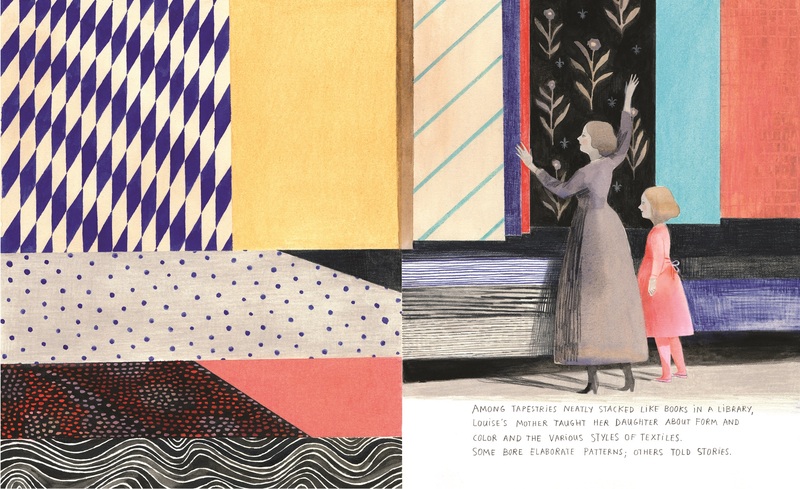 Both books serve as tributes to two incredible artists, who owed a great deal to the beauty and artistic sensibilities their mothers brought to their lives. And Arsenault’s artwork here is simply gorgeous. Her fluid and graceful lines, rich colors, and thoughtful symbolism give the book a striking emotional resonance. It’s one of the most beautiful books you’ll see this year. 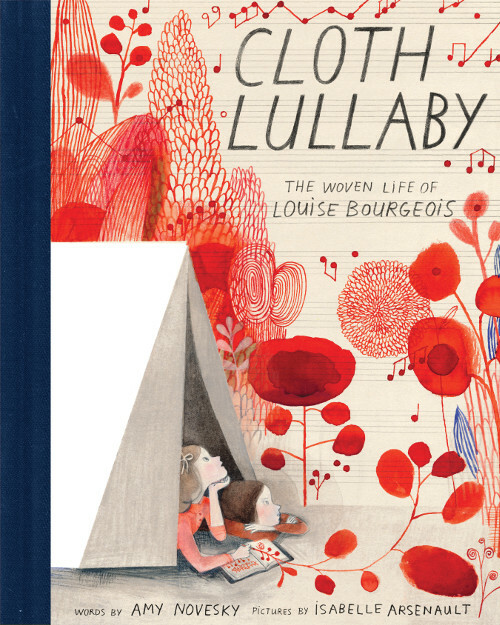 CLOTH LULLABY: THE WOVEN LIFE OF LOUISE BOURGEOIS. Copyright © 2016 by Amy Novesky. Illustrations copyright © 2016 by Isabelle Arsenault and reproduced by permission of the publisher, Abrams, New York. 1) I’ve been digging all week the various best-of music lists that one sees at this time of year, such as all of NPR’s lists. 2) I’m enjoying Adam Haslett’s Imagine Me Gone. 3) My friend in the spotlight! 4) Katherine Rundell at the New York Times. Thanks to Rachel for pointing this out to me. 5) A new song from Hurray for the Riff Raff. 6) Playing with my friends’ five-year-old last night. 7) Two 2017 picture book F&GS this week that were particularly wonderful. This book and the art by Isabelle Arsenault is truly breathtaking. It’s one of those books you can read over and over for the sheer beauty of it. I’m so happy you had a chance to play with a five-year-old Jules. They are so funny. 1. I got lots of book mail too. Some for this year and a little bit for next year. Children’s literature is the world’s saving grace. 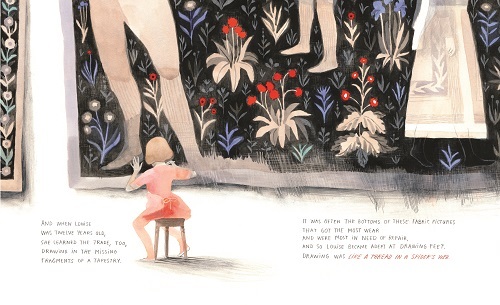 Isabelle Arsenault’s art work and pallette is stunning. What a story. Jules, the EOY music lists are always fun along with getting F&GS. Margie, seeing photos of Mulan makes me.smile. What are Flu-Fighter cookies? 2. Snowdays, 2 of them. 3. Poetry Exchange package arrived. 4. Good response to the New Year Poetry Postcard exchange. 5. Ten Minutes to Bedtime, compiled by Ken Nesbitt arrived for my baby friends. Hi Jules! What a beautiful book! I liked the NYT article on your list, too. Reminds me of Mirette on the High Wire. Margie, I love watching the paper whites and amaryllis grow. Jone, Ten Minutes to Bedtime is one of my favorites! Jules: Enjoy the music and the stories! Margie: Enjoy the company and the environment! Dow: Hi to the deet! Margie: MULAN! I love Mulan already, and we haven’t even met. I’m so happy for you. … And lucky you — to have snow! Jone: You too! I hope we get snow this year. … I have never heard of Flu-Fighter cookies. Dow: Maybe fake snow is how I need to get my own snow. Little Willow: I think this is the first time “precognition” has been in the wonderful puzzles that are your kicks. Stay warm, all! I’m glad to hear you all had good weeks, filled with good food, poetry, precognition, puppies, and Uno. Beautiful illustrations, and what a beautiful book. Jules – hooray for 5 year olds and music lists & beautiful essays! Margie – yay for snow and playing with Mulan. Jone – yay for snow and snow days and lunch with friends. Dow – yay for concerts and fake snow and visiting deer. LW – all the P’s this week, it puts me in mind of presents! 3) Indulging in my love of all Christmas movies by watching them while writing reports. 5) Katherine Rundell’s lovely essay, & her replying to my tweet thanking her for her beautiful writing. Fangirling over here. 6) Hot chocolate with marshmallows and whipped cream. 7) Daisy’s new silly trick of trotting back and forth along the back of the sofa and pulling her blankets off of it, which she happily performs at least once a day, whenever she thinks she’s not getting enough attention. Wow – what a gorgeous book. As my British friends would say – ‘off the charts!’. Having just spent a bunch on picture books, I’m now trying to figure out how to buy this one. How did I miss it? I’m always trolling for picture books about artists. Looks like a wonderful week for all of you this past week. I especially love thinking of those of you with snow! And watching Christmas movies – how great! Rachel: Rundell responded? How cool! … What’s your very favorite holiday film? Allison: I want to hear you give one of those workshops one day.